This month's First Thursday is tomorrow May 3 from 5-8 and we are focusing on the caretakers in our life. Moms of any shape, form and fashion. Here at the shop, the "Mama Mia" soundtrack will be blaring off the big screen and we will fill in with ABBA from the jukebox (the group that Mamma Mia is based on). I am reminded of the story behind one of the brands I carry. 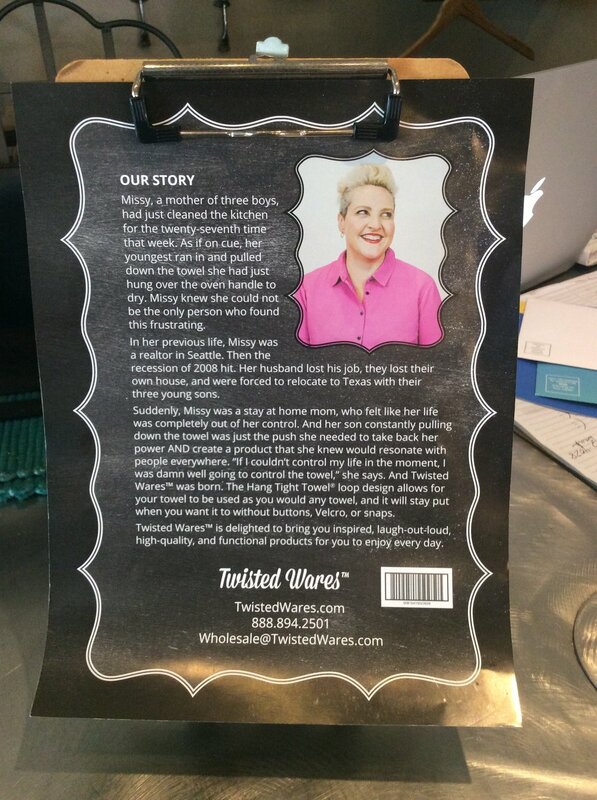 The brand name is TWISTED WARES and although her story begins with her line of dish towels and we happen to carry her cocktail napkins and T-shirts, I felt this story appropriate because you see the creator is a mom and her brand came about from living that role. The story is here for you to read and inspiring to me. She developed her brand based on where she was at the moment and I think that is the best. "Meet them where they're at!" as they say. I can picture this mom dazed and confused if you will using a lot of the sayings found on her products. "Shut up liver your'e fine!" and "Here Drinky Drink!" (Twisted Wares cocktail napkins-4.99) were probably common phrases on those special "mom" days. You know, the one where you see every other mother put together and killin' it when you feel accomplished because everyone has clothes on. Who cares if they are matching. One of our most popular magnets "Don't make me use your middle name!" (Anne Taintor- 4.99) is not by Missy of Twisted Wares but I imagine they would be great neighbors and meet on the porch for cocktails often. See the resemblance? So join us this Thursday May 3 from 5-8 and bring your mom, daughter, friend, sister etc.. and help us celebrate those people that represent any aspect of a MOM. Check out all of Missy's cocktail napkin sayings along with many other gift ideas for those who put up with us till we made it. Even if they did have to drink a little!